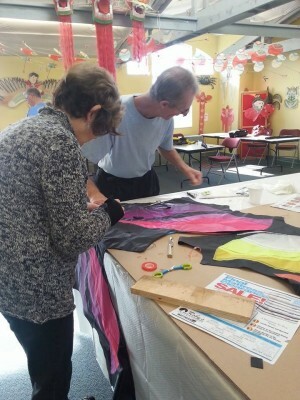 Volunteers help the World Kite Museum meet its mission and goals by donating time, talent and treasure to the Museum. We are grateful to our volunteers for their hard work and dedication! Volunteers work individually or in groups, performing a variety of duties throughout the Museum and at our events. Our volunteers are from diverse backgrounds and reflect the population of the Peninsula as well as the kiting community. We have two volunteer categories: Volunteers who work with the Public and Volunteers who work behind-the-scenes. Volunteers who work with the public welcome guests to the Museum, help in the gift shop, answer questions about our exhibits and special exhibitions, staff information desks, engage visitors through hands-on learning, and help with our events. Apply now to make a real difference in the lives of others and to meet other volunteers who are also passionate about kiting, history, science and learning. Volunteers working behind the scenes offer a wide range of essential services in the administrative, research and staging departments. These volunteers work side-by-side with staff in collection management, marketing, IT, HR and other departments. Skills generally required are organizational and administrative in nature and might include providing computer and clerical services, cataloging of kites in the library, or labeling of specimens in the collections. Whatever skills you have to offer, we have a place for you to share in the world of kites! [learn_more caption=”Requirements”] • The minimum age is 16; there is no upper limit. • All volunteers must take the commitment seriously and represent the Kite Museum with integrity.